Next step is, click the green button you can see on the left side when you scroll down. 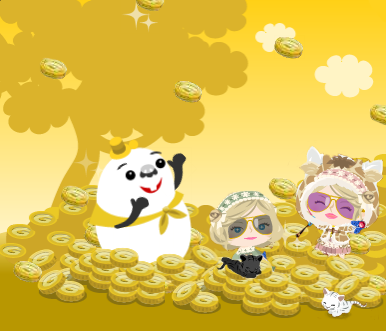 Then, you have to choose the amount of the Ameba Gold you wanted to buy. If you don't know the currency of yen to your country money. Just click on this site to check the the currency. And don't forget to　'Check' the small box to agree with the terms and conditions before continuing process. Then Click the big button to continue and enter your Credit Card Number. Enter the information of your Credit Card and click the Purchase button to end the process. Have a Great Pigg Life! Hi when your like on different Country like philipines,canada, and etc... will it convert? When my dad tried it today, it didn't work. We live in the USA and I think that's the problem: Japan is on the other side of the world. [EVENT] PICO ROCK BAND CONTEST! [Casino] SHOW TIME IN VEGAS! [Casino] Slot Campaign and Sale! [Casino] Week 3 - Blue Gacha! Get the Special Wedding Items! [3Days ONLY] Weekend SLOT 5x Event!! [Étoile Collection] Prom Photos with Everyone! Congratulations to Prom King and Queens!